A christening is a very special occasion for your little one. If you’re a devout Christian, it’s the first important step in your child’s spiritual life when they’ll be introduced to the Christian faith. Many non-churchgoers also choose to have their child baptized as a way of welcoming them into the family and community, and formally naming them. Whatever your reasons for having your child christened, you will no doubt want to mark the event by throwing a party after the ceremony, so family and friends can unite and celebrate your little one’s special day. Just like weddings, many parents like to follow certain traditions with christenings. The cake, christening gown, presents, even the food at some christenings, all have a special significance. Some traditions also spread across cultures and faiths. One such tradition, typically associated with Italian and Greek christenings, is to present guests with a ‘favour’ as they leave the party. The idea is becoming more and more popular at christenings in the UK. Here’s a look at why christening favours are given and 15 inspiring ideas to help you choose the perfect keepsake for your child’s special day. 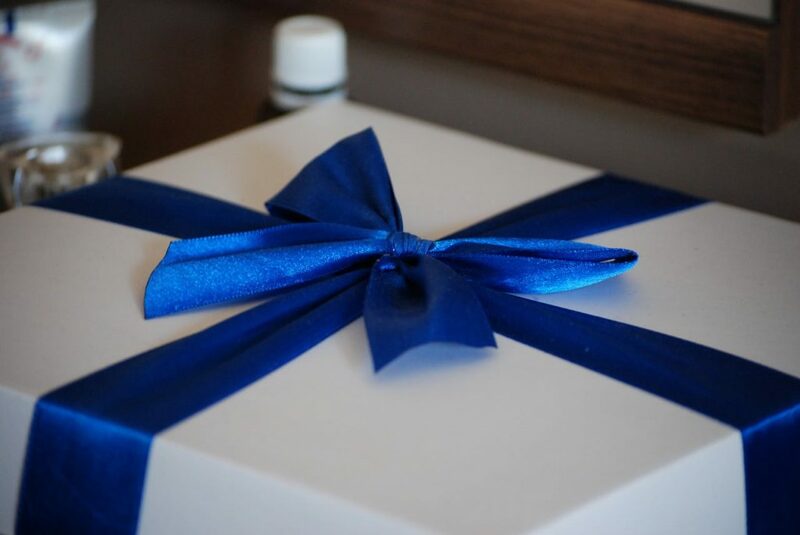 A favour is a small gift that’s given to guests at the end of a party to thank them for coming and celebrating your child’s special day, much the same way as a goody bag is given at the end of a birthday party. It’s also a small memento of the occasion. Depending on your budget, the favour can be as precious, frivolous or as simple as you wish. You can choose to buy specially ordered favours or you can make them at home. Adding a small thank you note to your favours will save you having to send out thank you cards to everyone after the event. Favours are also known by the Italian word bomboniere and are in fact mainly associated with Italian weddings and christenings. Traditionally, guests are given a small tulle or satin bag tied with a ribbon, which contains 5 sugar-coated almonds. The 5 almonds symbolise health, wealth, happiness, fertility and a long life. Although sugar-coated almonds, also known as confetti, have been used as favours in Italy since the 13th century, it’s believed that bomboniere gifts actually originated in 18th century France. Rich French aristocrats would present their guests with a gift on happy occasions. The gift was typically a small trinket box made from silver, gold, porcelain or crystal, and often covered in precious stones. The box contained either candied fruits or a sugar cube. Although bomboniere is an Italian word, it actually derives from the French word, bon bon meaning ‘sweet’. In the 18th century, sugar was a very expensive commodity that could only be afforded by the very rich. It came to symbolise power and wealth and was also believed to be medicinal. Although favours were given to thank guests for attending a special occasion, they were also used as a way of displaying the host’s wealth and social standing. Over the centuries, the value of sugar dropped and it became more affordable and accessible to all, so even the poorest families were able to give their guests sugar-coated almonds as favours. 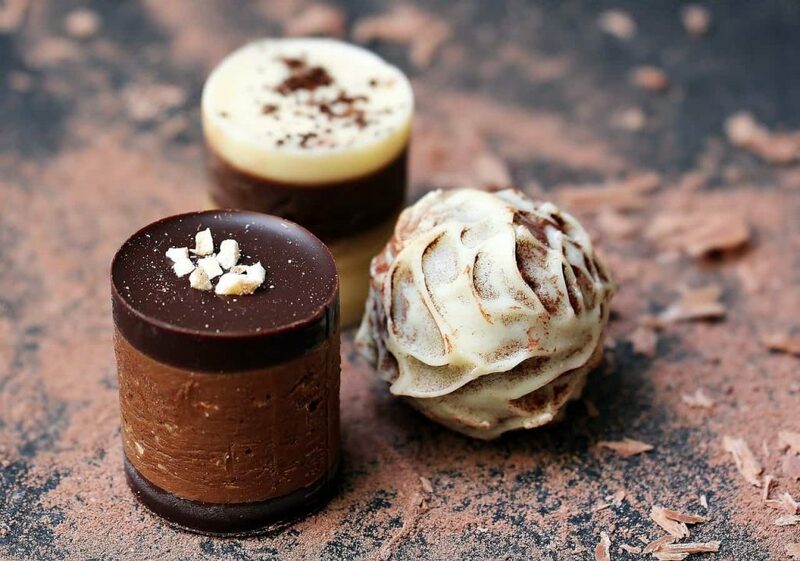 Today, christening favours are used throughout the world and almonds are often replaced with sugar-coated chocolate. The sugar coating is traditionally pink for a girl and blue for a boy. However, you don’t have to be Italian to give christening favours and they don’t need to be small bags of sugared almonds. In fact, thoughtful, useful gifts bearing the name of the child and the date of the christening are becoming more and more popular in the UK. Presenting your guests with a christening favour is a lovely gesture that will delight them. Favours don’t have to be expensive, but they should be small. After all, you don’t want to upstage and overshadow the christening presents your guests have brought for the baby. Favours can be personalised with the baby’s name and christening date by engraving or printing directly onto the item, or by attaching printed gift tags to the gifts. If you’d like to include favours at your baby’s christening, but don’t know what to choose, here are 15 ideas to inspire you. Silver has been long associated with christening gifts. In Tudor times, it was traditional for godparents to give the child a set of 13 silver spoons. The spoons represented the 12 apostles and the extra one: Jesus the Saviour. As silver was considered a precious and valuable metal, it was only given as a gift in very wealthy families. It’s believed the famous saying ‘born with a silver spoon in his mouth’ derives from this Tudor tradition. The silver gift tradition was very popular in Victorian times. Babies were given items such as napkin rings and jewellery, which then became family heirlooms. 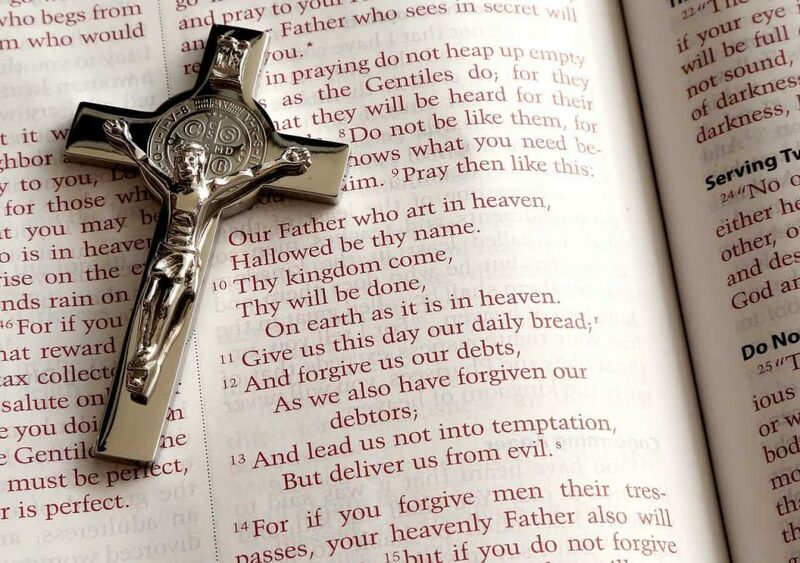 Keepsakes with a religious significance such as a cross or angel make popular favours. You can choose a small silver cross or a more rustic, small wooden carved cross, personalised with the baby’s name and christening date. A small prayer book is also a popular choice. A simpler, less expensive but meaningful alternative is a prayer card. You could choose an appropriate prayer or a favourite poem or quote to print on one side, while the other side could have ‘in remembrance of my christening’, the child’s name and christening date, or simply, ‘thank you for being part of my christening’. An ideal favour for a catholic christening is a small satin or tulle bag containing a mini pink or blue rosary. A drinking glass can be engraved or printed with the child’s name, occasion and christening date. You could also decorate the glass with an image such as a cross, angel or teddy bear. Choose a single stemless wine tumbler or champagne flute. A ballooned brandy glass or a small shot glass would also be ideal. Mini crockery items such as a china teacup or plate are good alternatives to glass. Choose a ready-made design or have them hand painted with a meaningful design of your choice and personalised with your child’s name. 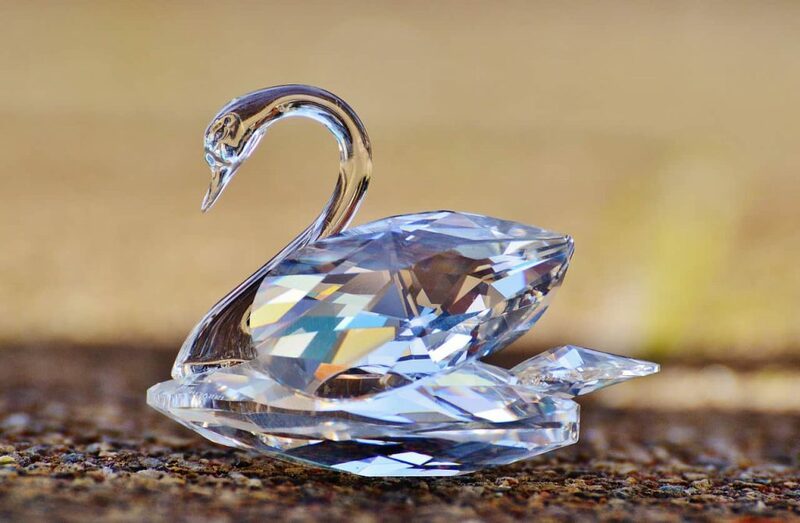 Lead glass crystal items make exquisite gifts, and none more so than Swarovski figurines. These delicate Austrian-made items are perfect as christening favours. If you’re happy to splash out, you’ll be spoilt for choice. Collections include miniature teddy bears, flowers complete with tiny vases, animals, sculptures and even Disney characters. Swarovski also make adorable miniature baby carriages and rocking horses adorned in pink or blue specifically for christenings. If your budget won’t stretch that far but you still want to add a special Swarovski touch to your favours, consider a clear Perspex box filled with sweets or chocolates, dressed with a ribbon and topped off with a tiny butterfly made from Swarovski crystals. There is also a range of less expensive crystal items available from online stores that make beautiful christening favours. Crosses, angels and even teddy bears are lovely small keepsakes that are large enough to be engraved with the baby’s name and christening date and come encased in a beautiful decorative box. Scented soaps, lip balms or soothing bath salts can make welcome and practical favours. They can be added to decorative gift bags or contained in specially designed tins with a personalised labelled lid. 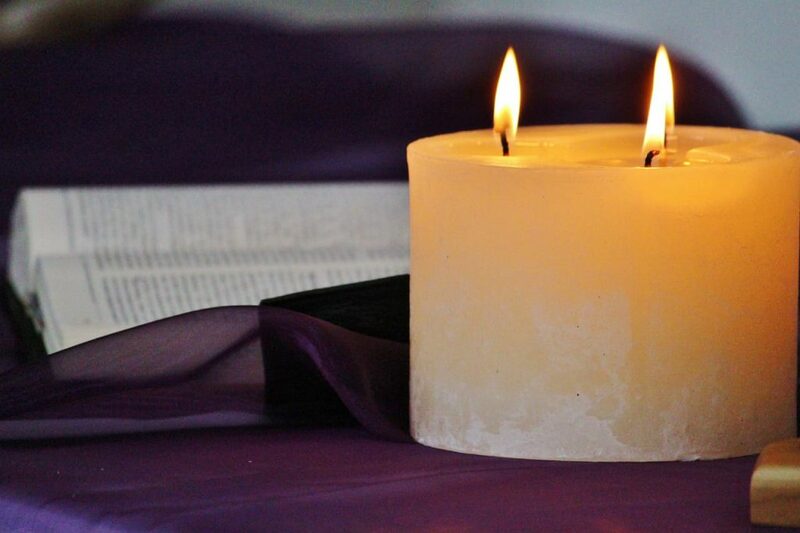 Candles are strongly symbolic at christenings and represent the light of Christ and the lighted journey through life. They also make inexpensive, yet thoughtful, christening favours. Candle colours have a special meaning. White symbolises purity, pink symbolises harmony and joy, and blue symbolises happiness. Popular fragrances include vanilla and lavender, while the festive fragrance of cinnamon and cloves is perfect for a Christmas christening. You can even get candles scented with homely cooking aromas such as cookies, gingerbread and hazelnut. A glass candle holder can be personalised with your child’s name and christening date or you can simply choose a holder with a cross motif. Tea light holders are another inexpensive favour that come in a variety of pretty designs and can be decorated with a ribbon and pearls for an extra special touch. For a more informal favour, choose a candle encased in a simple tin with a personalised label on the lid. Miniature jam jars make fun favours. They can be personalised with a printed or engraved design, and given empty or filled with candies, chocolates, sugared almonds or even fragrant spices or cinnamon sticks. If you don’t fancy sugared almonds, chocolate makes a great alternative. Even just a couple of handmade chocolates can be turned into the perfect favour if encased in a pretty decorative box with a gift tag attached. Another fun idea is a chocolate bar covered in a personalised wrapper printed with your baby’s name, christening date and even a cute photo. Bottle openers, fridge magnets, paper clips and even pens and smartphone pointers engraved with your child’s name, in various shapes or topped with decorative chains, are pretty christening favours that your guests will find useful. Seek inspiration from the 18th century French aristocracy and give small trinket boxes as favours. 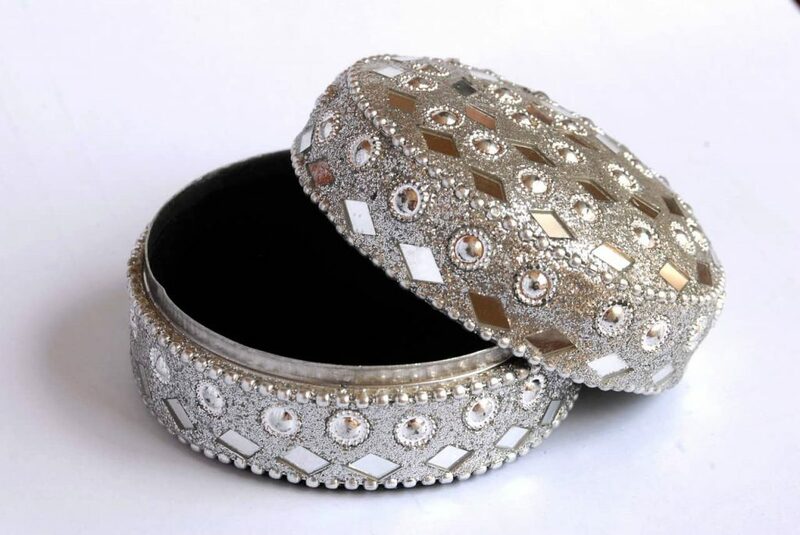 A ceramic or crystal box decorated in faux jewels is not only decorative, but can then be used as a container for earrings, rings and small pieces of jewellery. Another popular and useful keepsake is a bookmark. You can be as simple or as extravagant as you wish. An inexpensive, yet delightful idea is to create a laminated card bookmark with a ribbon or tassel end. One side can be printed with a prayer or special message and the other side, with the child’s name and christening date. You could even print a photo of the child or a drawing done by an older brother or sister. For something more extravagant, choose an engraved silver finish or chrome bookmark, or a silver rod with a hanging jewelled chain. 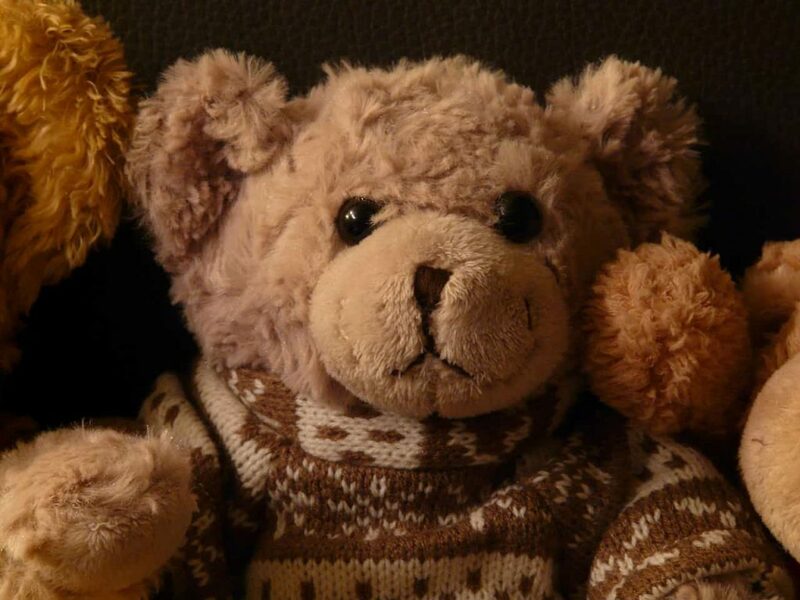 A plush, cuddly, miniature teddy bear is another thoughtful favour for young and older guests alike. You could have baby’s name embroidered directly onto the teddy bears’ tummies or dress them in personalised knitted jumpers. Paper packets filled with seeds make unique and inexpensive christening favours. The packets can be designed and decorated as you wish with the baby’s name, occasion, christening date and a personalised message. You can buy pre-filled seed packets online or you can order the packets and fill them yourself with seeds of your choice: flowers or herbs. For a truly green christening favour, choose plantable seed packets that can be directly immersed in soil. If you want to make your own christening favours, personalised printed cellophane bags can be ordered online. Tie them with colourful ribbons and fill them with candies, chocolates or dried herbs. Traditional satin or tulle bags can be filled with potpourri or fragrant dried lavender and used as drawer fresheners. 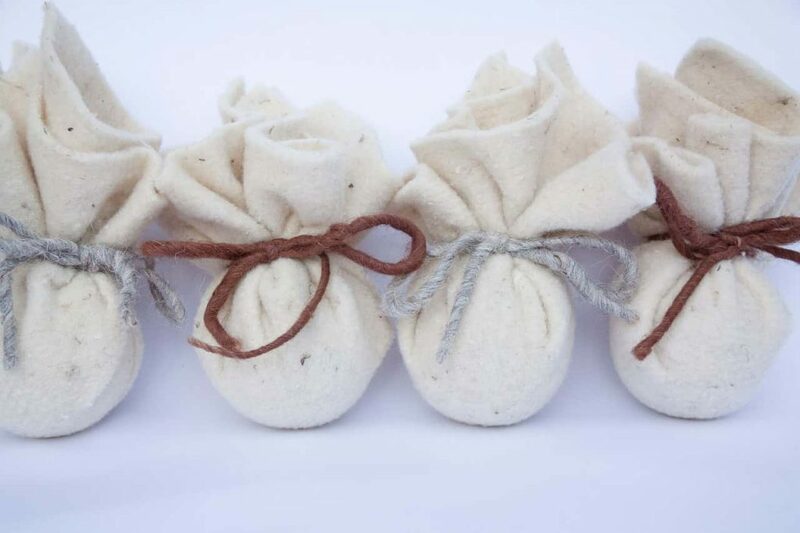 For a more rustic favour, choose a small burlap bag decorated with lace and buttons or tied with twine and attach a simple gift tag. If you want an alternative Italian theme, fill them with dried herbs or even aborio risotto rice instead of sugared almonds. For a Christmas christening, fill your bags with mulled wine spices and include a note with the recipe. If there are children at the christening, fill printed paper goody bags with crayons, balloons, confectionary and games as you would for a birthday party. 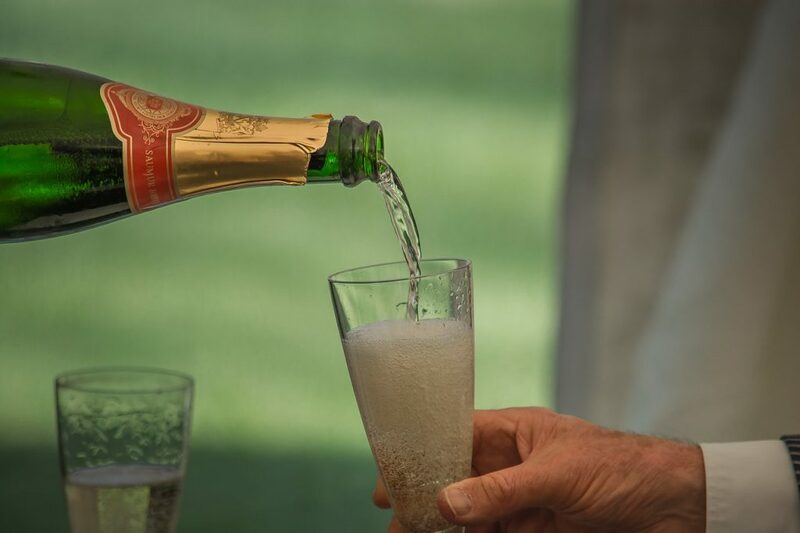 For adult guests fill the bag with a miniature bottle of champagne dressed with a personalised label marking the special day. If you’re preparing for a christening, head to the Little Doves website to see our full range of christening gowns.